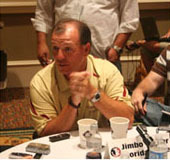 Florida State football coach Jimbo Fisher talks with reporters on Monday. Second-ranked FSU (8-0, 5-0 ACC) hosts UVA (4-5, 2-3 ACC) on Saturday at 6;30 p.m.
“It was good to get a day or two off on the weekend to relax and catch your breath after a long trip back Thursday night. I think guys were able to recoup and heal a little bit. I think it came at a good time in the year as far as getting banged and bruised this time of the year and go to make a stretch run down the last four regular season games and where we go from there. I am very proud of our team and how we competed in the game. It was a great game up in Louisville. It was a great environment and a very good team. They are dynamic in all three phases and played a heckuva game. Our kids just kept finding ways to make plays, compete in the game and did a heckuva job of staying in the game in a very tough environment. Getting road wins in this league is very tough. They are always big time games that you have to play and I am very proud of our kids for competing in those games that way. Saying that, we now have that game behind us. We have to move on and get ready for a Virginia team. Virginia has lost a couple games here lately but they are still a very good football team. Defensively they are very dynamic. They blitz and bring a lot of pressure. John Tenuta and the guys have a lot of experience on that staff along with him as a coordinator do a great job. They can really rush the passer. Eli Harold and Max Valles can really get after the passer and they bring a lot of pressure. They can cover the secondary. They are very multiple in their coverage’s. Upfront, [David] Dean, Henry Coley and those guys can all blitz and make plays. They just have a very good defensive football team and they always have. They have very good numbers. Offensively, they really have found their game. They are running the football very well. Kevin Parks and the backs are running the ball extremely well. They are getting about a hundred yards every week. He got a thousand [yards] last year and I think he will probably get a thousand [yards] again this year. He is playing very well. They run a lot of boots and move the pocket. Greyson Lambert and Matt Johns do a good job there. Darius Jennings is a very fast and electric receiver. The tight ends they use very well. Another big receiver No. 17 I guess is out, but he was a heckuva player too. They have plenty of weapons. They are very big and strong upfront. They are good in the kicking game. They are a very good football team. Mike London is a very good coach; a very good guy and they have a very experienced staff. We will have our hands full. We have to be ready to play. We are in the bottom four of our games as far as the season. We are in the final home stretch of the season. We need to play well in November. Like I said, they always remember November. Those are important games and games you have to play well. We have to get better as a team and I am looking forward to the challenge.